We offer the following guidelines to aid you in a successful presentation at the ASEV National Conference. 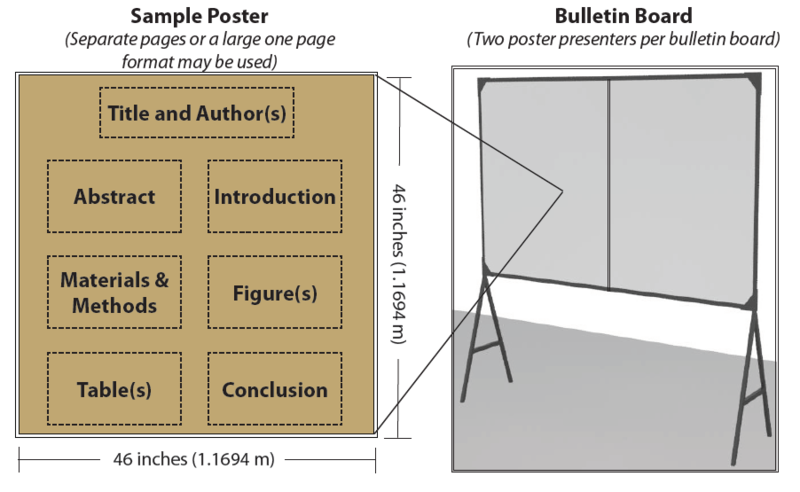 The goal of a poster session is to convey information by the combination of a visual display, questions and discussion. This is a good opportunity for direct exchange between conference attendees and you, the presenter. It also provides more time than an oral presentation for attendees to absorb the technical information. It is necessary to pre-register for the ASEV National Conference. Click here to register for the conference through June 11. Registration is not complimentary. We extend our pre-registration member rate of $235 USD to all presenters through June 11. However, ASEV Student Member presenters are entitled to complimentary conference registration (General Registration, Wednesday & Thursday). If you are not an ASEV member, we encourage you to join. Obtain your badge and registration material at the conference in the ASEV registration area. The assigned presentation time to attend your poster is 6:00 p.m. – 7:30 p.m. on Wednesday, June 19 during the Napa Valley Regional Wine Reception in the Napa Valley Marriott Hotel. A professionally lettered sign with the assigned poster number will be provided. pages should be a minimum of 18 point type. Tables, graphs and diagrams should also be enlarged. Enlarge graphs, figures and text so that they can be easily read. Some conference attendees that visit your poster will expect a handout that includes supplemental information and a summary and conclusion. You may opt to provide a photocopy version of the poster material. Some student poster presenters have been assigned 3.25-minute (including introduction) oral Flash Talks. These “flash” presentations will provide additional opportunities to interact with conference attendees and to briefly review your current research highlights. Enology Flash Talks will take place on Wednesday, June 19, from 5:05 p.m. – 6:00 p.m. and Thursday, June 20, from 2:10 p.m. – 2:30 p.m.
Viticulture Flash Talks will take place on Wednesday, June 19, from 5:05 p.m. – 6:00 p.m. Refer to the online daily schedule for presentation times and titles. All presenters are required to set up their poster(s) on Tuesday, June 18, between 7:30 a.m. and 5:30 p.m. or Wednesday, June 19, between 7:00 a.m. and 7:30 a.m.
Push pins are provided and will be located in the bulletin board area. The posters will be on display for viewing on Wednesday, June 19 from 7:30 a.m. to 11:45 a.m. and 1:30 p.m. to 7:30 p.m. and Thursday, June 20 from 7:30 a.m. to 11:45 p.m. and 1:00 p.m. to 5:00 p.m.
Presenters must dismantle their posters between 5:00 p.m. and 7:15 p.m. on Thursday, June 20. We would appreciate your cooperation in dismantling your material only during this time. If you are unable to do this in person, please ask a colleague to do so for you or contact the poster session chair. All current students who will be presenting at the ASEV National Conference will be eligible for the ASEV Best Student Presentation Awards. There will be separate awards for enology and viticulture for oral, poster, and flash talk presentations given by students, as evaluated by the Best Student Presentation Awards Committee at the National Conference.